We at MBS pride ourselves in our tireless thirst for knowledge and mastering of our craft. Our staff is highly trained, experienced, knowledgable and continues to stay on the cutting edge of fitness. Please feel free to ask for help at any time. We are here to serve you. Melissa is the highly motivated and wonderful owner of MBS Fitness Studio. Melissa has worked in the fitness industry for 7 years. She is a level 6 certified TRX Suspension/RIP instructor and Coach. Trained and Certified Spin instructor, and NASM certified Personal Trainer. MBS Fitness Studio came about when Melissa had an idea to offer the community an elite fitness center where “healthy” means in mind, body, and soul. Melissa has had a love for fitness ever since she was a young adult and suffered with depression. Exercise became a better way to deal with life. As she began to work out, she began to feel an overall “high” in mind, body, and soul. As a trainer, Melissa has adopted this mentality, and shares it with her clients. Melissa loves to see people feel better about themselves. Her goal is to help as many people as possible change their lives for the better. She coaches people to move better, become present in the moment, and love themselves for who they are. She desires to help her clients feel amazing inside and out. "Breathe in, breathe out, let go, move on. And always... Live in the moment." Shelby Jorgenson is a graduate of the Integral Yoga Institute in West Virginia. She has been practicing and teaching Yoga since 1986. Her classes are devoted to teaching the whole of the person; Mind, Body, Spirit. Her philosphy is "There is no such thing as a 'perfect pose', only your perfect pose". Shelby creates and holds a space for the student to experience the wholeness of themselves, just as they are. She teaches the poses as a form of meditation. She encourages her students to linger in the pose and listen to their bodies and how the pose wants to express through them. Each pose compliments the other, allowing the many parts of the self to find expression and balance. Shelby is also certified in Pilates, and Spin, as well as Personal Training. She abounds with caring enthusiasm for all she teaches. "Be you...The world will adjust." Jess comes to MBS with a large background in athletics. Jess played volleyball and basketball most of her life. Jess is an avid runner, volleyball and softball enthusiast, as well as an extremely qualified TRX Instructor and coach. Her passion for fitness combined with her excellent coaching ability makes her an integral part of the MBS Team! Jess is truly inspirational! She worked out during her entire pregnancy with daughter Avery and even when heavily pregnant, always gave her all! We love having Jess as an Instructor! Although Avery may be the youngest team member at MBS, the joy she brings is palpable! Young Avery has been with us since inside her mothers womb. Now at over 2 yrs old, she comes to many classes and keeps a keen eye on members as they work out. She is always ready and willing with a warm smile to brighten your day! Avery is amazing and we LOVE having her in our studio. 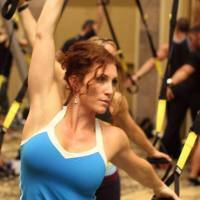 Sarah teaches TRX, Spin and Weight lifting. Sarah is also a full time wife and mother to 3 incredible kids. Sarah recently began a career with the US Post office. Sarah fell in love with TRX 5 years ago. She chose to become a TRX Instructor to share her love of TRX and help people to better themselves. Sarah is very high energy and approaches fitness with this same enthusiasm . When Sarah isnt helping others achieve their fitness goals at MBS, you will find her outside gardening. Another passion she adores. Sarah rises with the sun to exercise and have fun.